Here at St. Stephens we are aspiring Purple Learners! We believe that having a positive and ever-growing mind-set towards learning is vital. In order to become Purple Learners, we have to think about all aspects of our learning and how we learn best. We think about how our learning affects others, how we use communication and we even think about our own thinking! In every classroom, a target is displayed. This target has three areas that represent learning. In order to work in the purple zone and become Purple Learners, we can think about our learning, behaviour and thinking. Movers and Blockers relate to the behaviour we can have in class towards our learning. If we show 'mover' behaviours then we are helping our learning. 'Blocker' behaviours can stop us and others from learning and remaining in the 'Challenge Zone'. We understand and appreciate that mistakes are a step in our learning journey. We never give up and always try our hardest. Having a growth mind-set allows us to learn from our mistakes and see them as opportunities for learning. We have learnt that the brain is a muscle and a fixed mind-set would permit it from growing! Who are our Purple Learners? Thinking about all the things we can do to work in the Purple Zone, we discussed in classes the qualities of a Purple Learner. Each day a child is chosen to be a ‘Purple Learner of the day’. At the end of the day children celebrate how this child has worked as a Purple Learner and award them a medal and certificate. 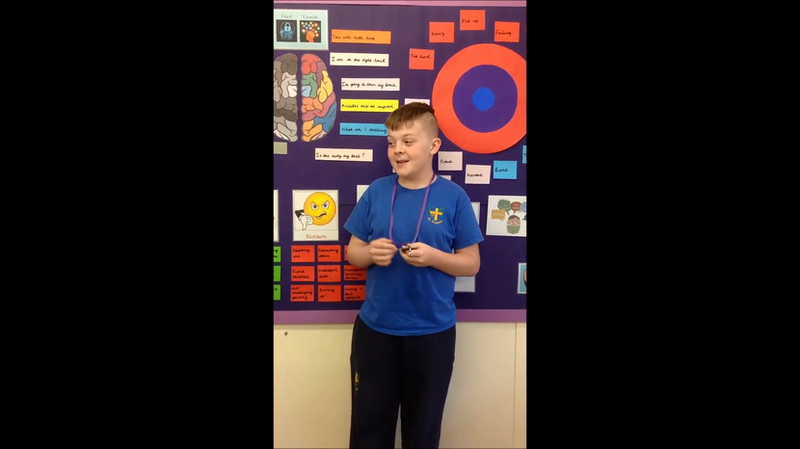 Below are some of our Purple Learners explaining how they achieved ‘Purple Learner of the day’. How are you a Purple Learner?